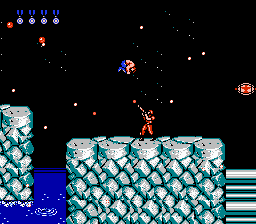 The purpose of this page is to document all of the known tricks of the NES Contra game so far. NES Contra (JPN) in 08:57.98 by adelikat. Looks like the bare-chested man decided to bring his friend along for the ride this time. Using two players at once, adelikat brings us one step closer to perfecting Contra. This run displays many new time savers, including spread gun manipulation and 2P death skips. More details can be found in the submission text. 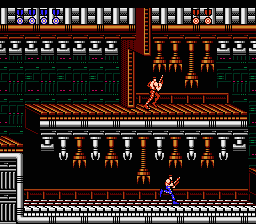 Note: This game was released under different names, such as 魂斗羅 (kontora) in Japan, and Probotector in Europe. GryZor is also used in Europe on some other systems. NES Contra (JPN) "pacifist" in 09:41.36 by adelikat. The hero shows the ultimate display of pacifism by sacrificing his own life in order to not harm the Level 5 tanks. This movie is about 4 seconds faster than the preceding version due to better boss fights and one more use of the level 3 "jump glitch". In Stage 3 it is possible to jump to ledges normally impossible by taking advantage of vertical scrolling. To perform it you jump, then press left, then hold right. It seems random, but if you press right at the right frame, you will stay in air for longer than usual and can land on ledges that would normally take 2 jumps. Conversely, this can also be used to jump shorter than normal. This should be used on all other jumps in order to shave a frame from each one. (In reality many of them can not be shaved this way). Boss HP can only drop 1 HP per frame. This means the strategy isn't as much about unloading bullets as fast as possible, but instead trying to make sure damage is registered every frame.